Agardhbukta is, at least today, more easily reached in winter than in summer. In winter, or rather in spring, it is a trip of a few hours by snow mobile. The guided snow mobile tours to the east coast actually aim for Mohnbukta further north, with the combined glacier front of the three glaciers Königsbergbreeen, Hayesbreen and Heuglinbreen. It is much harder to get to Agardhbukta in summertimes. This usually requires a rather demanding trekking tour of at least 3-4 days – per way, including glacier and river crossings and the whole lot. The classical route follows Adventdalen, Sassendalen and Fulmardalen. This is called the “Conway-route”, after the first successfull overland crossing by the British mountaineer Martin Conway and his group in 1896. View of Agardhbukta in midnight light, mid August. Agardhbukta was the backyard of the famous hunter Hilmar Nøis who had his main hut Fredheim in Tempelfjord. In spring, he often came over to Agardhbukta by dog sledge to hunt polar bears. 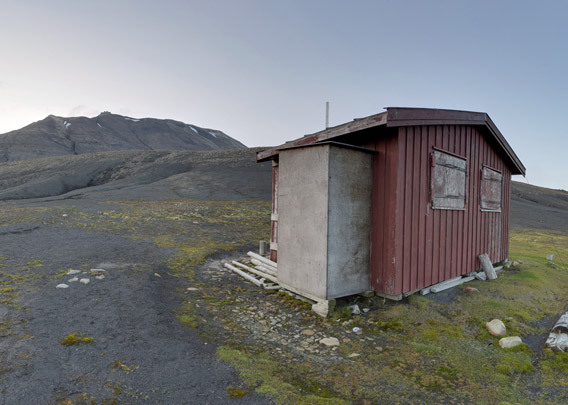 Today, there are 2 rather modern huts on the north side of Agardhbukta. One belongs to the Sysselmannen, the other one to a club (Jeger- og Fiskerforening) in Longyearbyen. They may be used by club members who live in Longyearbyen (and you really have to be a local (!) club member to get access to it). The Jeger- og Fiskerforeningen hut in Agardhbukta. 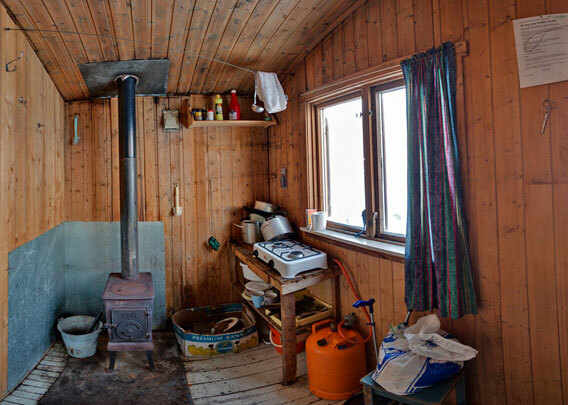 Interior of the Jeger- og Fisker hut. 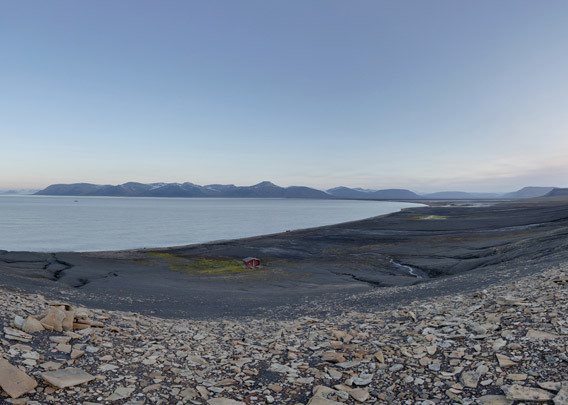 From the sea, which is the way most people travel in Svalbard in the summer, Agardhbukta is a difficult-to-reach place and it is certainly not commonly visiited by tourists then. The waters are shallow and badly charted, and if you want to venture for a landing, then you should have optimum weather and sea conditions. On the shore in Agardhbukta. 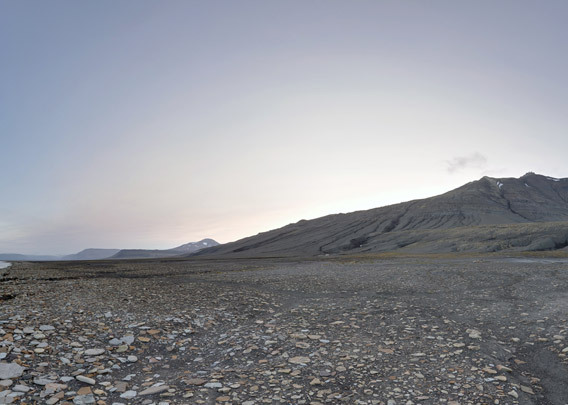 The tundra here is pretty barren and the ground dark, due to the dark Jurassic shales in this area. 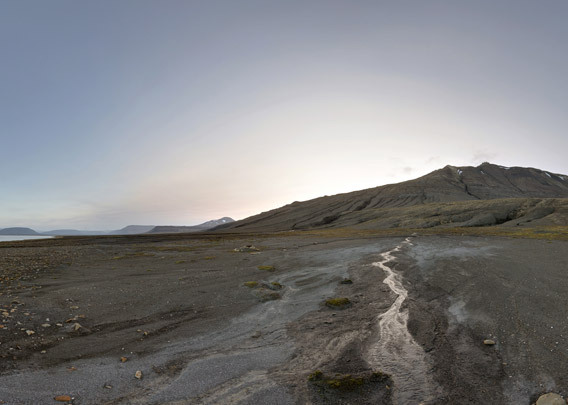 The landscape can appear altogether rather bleak and desolate. If you get fog while you are stuck here for some days, then you should be in peace with yourself, otherwise your stay in such a landscape may turn out to be unpleasant … if you like being in a desolate place and you have enough chocolate, maybe a good friend and something to read, then it is great 🙂 Oh yes, and it is always worth to go out trying to find fossils!